This is the second part of the manual whose intention is to train people on how to manage the tasks of the team. Only Rental Managers, Admins or Team Owners can see the views that will be described here. Click here to see the first part of this tutorial. Booking related jobs are jobs created that are attached to a Booking. This means, that their start and due dates are relative to the check-in/out times of that Booking. You will see them in the calendar and look the same as all jobs. The only difference is, as they are linked to a booking, if you put your mouse over a booking, it's related jobs will be highlighted. On the other hand, if you put your mouse over a job, you will see highlighted his related booking. Jobs created according to your scheduled jobs. They are just jobs that are created by Rental Ninja system according to the settings of your scheduled jobs. Those jobs will be updated automatically by the system every few minutes according to changes made on booking times or change made on the scheduled job that created it. By clicking on any of the Bookings you see in the calendar, and clicking on the "Create job" button. This job will only be updated according to changes on the booking check-in/out times. A manual job is a type of job which is not linked to a particular booking nor created thanks to a scheduled job. So you just choose the starting and ending time of the job and all it's details. To do so, just put your mouse on a calendar cell and click on the "+" icon that appears. If you need to include something else which is not shown in the form when you create the job, just click on Save and, once created, just edit it and you will be able to include more details on that job. Attention: if you change the dates of the job, it will not be updated anymore according to the Scheduled Job as it will now be considered as a Manual Job. Normal bookings are displayed in BLUE and blockings (unavailable dates) are shown in GRAY, and on top of each booking you will see the jobs that relate to them. Jobs that need your attention will be either RED or YELLOW. Red means that they are passed due. Yellow means that they are assigned to a role. This means that any person with that role and access to the rental, can claim the job. An alternative to claiming the job is that a rental manager assigns this job to somebody. Use the arrows on the bottom-right corner to navigate horizontally in the calendar. TIP: instead, hold the shift key of your keyboard while your mouse is on the calendar and move your scroll wheel. Display note: jobs in the calendar have a minimum display length. If the job duration is too short, it will be displayed according to the minimum display length. 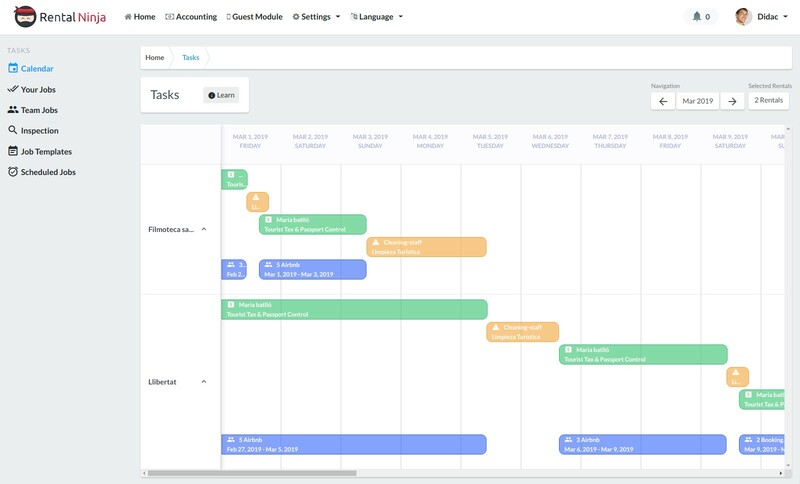 This view is a different way from the calendar to see the jobs of your team. Here you can see them listed according to their status: Current, Upcoming & Completed. If you want to edit any of those tasks, first click on "View" and then "Edit". You will be able to change anything from the task. Here, similarly to the Team Jobs view, you can see the jobs that you have assigned to inspect. If you want to inspect a job, just click on the job you would like to inspect. You can only inspect jobs which are completed. If you take a look at the following image, you can see that the system is warning that the job can't be yet inspected as it has not been yet completed. If the task looks good, so the assignee completed satisfactorily, you just need to click on the "Approve" button. Otherwise, reject it. By doing so, the task will be marked as "uncompleted" and the assignee will receive a notification about it, meaning that has to be re-completed.